So the new Doctor Who has finished her historic first season, which I found had its ups and downs: episodes like Arachnids in the UK, Kerblam! and The Witchfinders really resonated with me, whereas The Tsuranga Conundrum, The Woman Who Fell to Earth and Rosa really did not. Episodes like Rosa, Arachnids and The Battle of Ranskoor Av Kolos wrestled with great ideas and even reached for greatness at points but had baffling lapses in logic, whereas some of the most iconic images and ideas, like the crane leap and the “I’m the Doctor, sorting out fair play throughout the universe” came from episodes I find myself the least interested in rewatching. But leave all that aside: from th beginning, this Doctor caused a sharp divide among fans, there’s a huge gap between audience and critic ratings, and there’s a persistent rumor about this Doctor being a failure because of low ratings. Go out into the blogosphere, and you’ll see conspiracy theories of a particular blogger telling his fans to downvote Series 11, and other conspiracy theories by these fans that the viewing numbers of the series are somehow inflated because people just can’t possibly be watching it. I won’t dignify conspiracy theories about reviews or ratings: there’s a lot of genuine fans unhappy with the new Doctor, and there are millions of people watching it, more in my circle than have ever watched it before. But I can address one question solidly with real data: is Jodie Whittaker’s Doctor doing worse in the ratings than the Doctors who came before her? No, she’s not doing worse; she’s doing just fine. 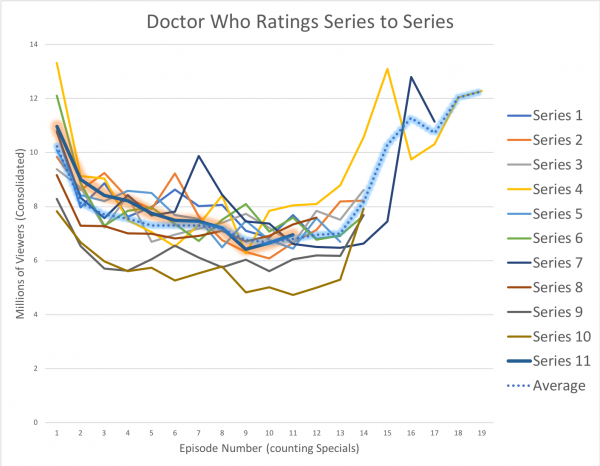 Taken from the Wikipedia articles on this series and its predecessors, along with the Doctor Who Guide, I was able to put to rest the conspiracy theories about Jodie Whittaker having some kind of ratings dropoff compared to the other Doctors. Nope. All of the recent Doctors start well, drop off, and rise near the end of the season. Jodie is right on track – in fact, slightly better than average for 11 episodes into the season. True, she hasn’t had the insane spikes in ratings that David Tennant and Matt Smith got near the end of their runs, but those were series of highly promoted event specials. I rather like Jodie Whittaker’s Doctor, and I love the emotional arcs of the new series, and Bradley Walsh is so damn good I could probably enjoy watching him watch paint dry, but the stories in the new season need a little work on basic logic and truly threatening monsters. Logic in the new Who was always a bit dodgy, but it’s getting worse, and the lack of series-long arcs and recurring monsters is doing the Doctor no favors. Here’s hoping in the 2020 season the Who team keeps doing what they’re doing well, while also finding ways to do more of the things that made classic, um, New Who great. Next PostNext FROST MOON on sale 1 more day!